This is a book I was waiting for. I thoroughly enjoyed book 1 in the Daughters of Bainbridge House series by Laurie Alice Eakes. It sparked my interest to learn more about the heroine’s endearing sister Cassandra, her complicated love life, and most of all, her love of science and hot air balloons. Then when I saw this gorgeous cover, I knew that despite my mile high to-be-read list, I had to take time for this one. The story opens in 1812 England with high drama as Cassandra and her fiancé are attacked in their carriage while engaged in a passionate sort of encounter that was frowned upon in the Regency Era. When Cassandra is nearly fatally burned, she feels God is punishing her, and she determines to end things with Lord Whittaker once and for all. Her father supports her decision, going as far as to threaten the fiancé. Perhaps the most confusing element of the story is how Cassandra ended up at Lord Whittaker's country home, but I was willing to suspend my disbelief because I know and trust this author, and sure enough, by the end, everything worked out. While there, she focuses on her dream, hot air ballooning. She is helping to design a balloon, and despite her recent scrape with death, longs to fly it herself. Meanwhile, Lord Whittaker is caught up in dangerous espionage and simultaneously trying to win Cassandra back. This novel is full of excitement, twists and turns, heartache and redemption, adventure, romance, and even a touch of humor. My favorite element was the hot air ballooning. The descriptions were so heavenly I felt as though I was flying myself. The science behind these early flights fascinated me as well. The other aspect of the book I enjoyed was seeing this passionate heroine learn to forgive and accept herself, although it was difficult seeing a young woman being so hard on herself for something that would seem so natural today. It served as an important reminder that God seeks to gently restore us, not punish us or leave us to wallow in guilt. 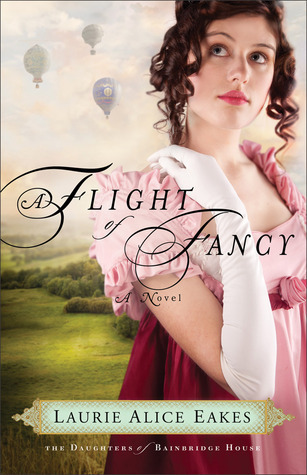 I love reading about strong heroines who aren’t afraid to go against society to live their dreams, and Flight of Fancy was no exception. Have you enjoyed any of Laurie Alice's books? This week we discussed a female race car driver and a female hot air balloonist. What sort of adventures have some of your favorite heroines had? I love adventures. I love heroines who are ahead of their time. Among my favorites are Ribbons in the Wind by Margaret Brownley - historical romance about a woman racing an automobile across the country, Catching Katie by Robin Lee Hatcher - historical romance about a woman running for congress, and the above-mentioned female race car driver At Every Turn by our dear Anne Mateer. I will definitely read this book, Dina. It sounds like a winner, the cover is indeed gorgeous, and I loved Laurie Alice's Lady in the Mist. Yes, I really enjoyed Lady in the Mist too. The hero in that book still stands out in my mind after reading probably 100 other books. Catching Katie was one of my favorites, too, Suzie. I know I read Lady in the Mist. I must have been distracted. Will have to read it again! An excellent review, as always, Dina. p.s. Spotted one of Laurie Alice's LIHs at Walmart the other day. Too cool! I just read Laurie Alice's post on Cross and Cutlass, with MaryLu Tyndall's review. It was a nice addition to Dina's review because Laurie Alice revealed how this book changed a lot from her original idea. I love that. I have not yet read A Necessary Deception. (I guess I'm waiting to grab it for 'cheaps' on Kindle. I really became a big fan of this author with her midwife series. Her characterization was wonderful and I know she is meticulous about her research. I think I'll be asking to borrow via Kindle, one of these days, so I can get caught up! Although it's pretty hard to keep up with all of Laurie Alice's fiction! I loved Catching Katie also. Isn't that funny how it stuck with all of us? I think I could be very happy reading all day to my heart's content. Oh the books I have yet to read that I want to read!!! And then there's the cost. Oh well! Niki, you really saw The Carpenter's Inheritance at a Walmart? I didn't know they were selling it in stores. Suzie and Dina, yes, Dominick may be my favorite hero, though Rafe is kind of the darker brooding type who kind of gets me too. My others are more beta and sweet. Debra, sorry you missed that Deception was only 2.99 on Kindle about four months ago. Laurie Alice, thanks for stopping by and sharing more about your story. There was a lot about this book that really captured me despite the difficulties you faced in writing it. I'll have to check out this Catching Katie that everyone is raving about. I've only read a sample of a Robin Lee Hatcher book, but I liked it. Great review, Dina. Laurie's books are always so well-plotted and I've been looking forward to this one, too. I've enjoyed it! I read the Robin Lee book when it was Kissing Katie for the secular makret. Always wondered how she changed it. Interesting. I didn't realize that.